Are you one of those people who believe that sleep is a luxury? Are you lucky to get 3 – 4 hours of sleep a night if that? If so, you are not alone. In a recent email a friend wrote, “I am trying to not worry too much about my job and issues with my aging Mom, etc…. I need help with how to turn my brain off at night without having to resort to taking sleeping pills.” His lament is something I frequently hear from clients as well. They are busy all day long and once it is time to relax and get sleep, the mind starts to race. I always advise anyone with sleep issues to first get checked by their doctor. Obviously there are physical conditions that might be causing sleep issues and that needs to be addressed. Once we are sure it is the night time worries, it is time to learn some behaviors that will help sweet sleep return. It is known that caffeine is a stimulant, but so too is tobacco. While alcohol may help one fall asleep, once it wears off then wakefulness sets in. So while giving these items up is the best option, at the very least one should avoid them before bed. Keeping up with exercise is recommended for good sleep and for better mental health! Just 20 minutes a day improves not only the heart, but the brain according to Dr. Daniel Amen, a medical doctor and psychiatrist who authored many books on the brain, including Change Your Brain Change Your Life and Use Your Brain To Change Your Age. There are numerous studies that back up the wonderful connection between exercise and a good night’s sleep. But, what if your issue is really the late night antics of the mind? Once everything is still for the night, your mind goes into hyper-drive. Suddenly you review the day and it seems as if everything you did was wrong! Tomorrow looks to be even worse and the sky is surely falling. Well, now it is time to take back your mind and get some sleep. First of all, remember to reframe and refocus. Notice the dialogue in your head and challenge it. Are you really going to end up homeless because you didn’t refill the coffee pot in the break room? Do you have nothing else, no other resources that make you essential to the job you are doing? Sometimes we just need to notice how ridiculous our thoughts are. If you are concerned with a list of tasks and events you want to be sure to accomplish, write them down on a list before bed. Keep a pad next to the bed in case you absolutely need to add anything to the list. Just taking a thought and putting it on paper allows the mind to begin to settle down. If you do a 5 -1 count it helps. Find 5 parts of your body that are comfortable. Notice how does each part feel? Recall 4 memories of the day that you feel gratitude for. What are 3 things you can remember seeing before the lights went out that caused you to smile? Can you feel the smile again? Check for 2 scents you smell in bed. Are they familiar? Are they sweet, pungent, or something else? Finally, listen for 1 sound that you hear that is soothing, what might it be? Is it the sound of your own breath even? If you imagine breathing in each color and at the same time imagine healing the area of your life that it represents, you will likely find yourself drifting off to a pleasant dream state. Your brain is an expert at having insomnia.It doesn’t know how to do it differently,otherwise you would be able to sleep easily. Therefore, it is important you can teach your mind how to relax, letting go of worry so that you can fall asleep and stay asleep. Hypnosis techniques will help you manage your worry, anticipate easily falling asleep and create a new and healthy outcome. 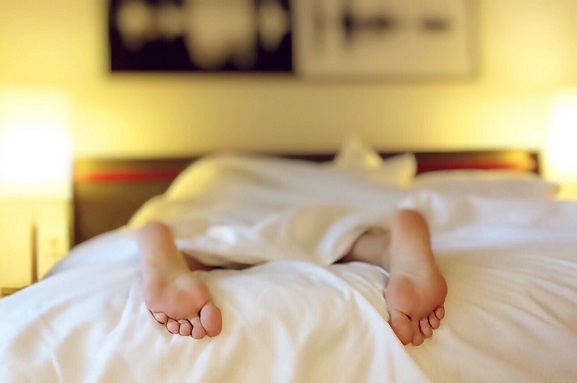 Some benefits of getting adequate sleep include releasing anti-aging hormones which help you maintain your youth, maximizing your metabolism, enabling you to control your appetite better, allowing you to relax, and keeping your mind and memory sharp. Getting the sleep you need also increases the feel good hormones released by your brain which makes you feel happier.